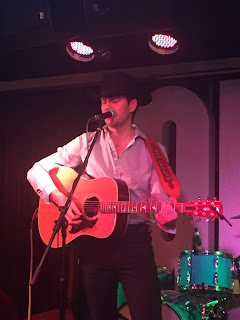 Three Chords and the Truth UK: Aaron Watson + Sam Outlaw - The Glee Club, Birmingham. Wednesday 27th January 2016. Aaron Watson + Sam Outlaw - The Glee Club, Birmingham. Wednesday 27th January 2016. Nashville Tennessee may be the spiritual and corporate home of country music, but it was the case of the western states fighting back at the Glee Club tonight as Texas and California flexed their muscles in the capable hands of Aaron Watson and Sam Outlaw. It was also a scenario of two gigs in one as both artists maintained the high quality in expressing the breadth of country music. What was absent was superficial commercial drivel and you were witnessing two contrasting songwriters and performers dedicated to making music on their own terms. You can take your pick between the up tempo Texas road dust rocking of Watson or the smooth west coast vibes hailing from Outlaw. However there is no law around being greedy and waxing lyrical about both. Sam Outlaw hails from Los Angeles and flavours his music with a heady mix of classic country and border twang. His new album ANGELENO has just had its UK release some six months after taking a bow in the US, giving Sam plenty of stellar material to share with new listeners on his travels. Alongside this visit in support of Aaron, Sam is returning to our shores in April and is turning the heads of promoters and venues more akin to the folk/Americana side of the genre, often a safe haven for his type of music in these turbulent times. Immediate impressions of Sam were a striking resemblance to Cale Tyson, although perhaps a touch smoother in his style, but absolutely equal in the stunning impact they have both made. As you would expect the bulk of Sam’s forty-five minute opening set was comprised of songs from the new album and these possessed the same appeal as the recorded versions when delivered live with fellow guitarist Danny Garcia on accompaniment. Even within the constraints of touring acoustically, the timely whistles enabled perfect memory recollection of the pedal steel pieces. There was no evidence of any nerves infiltrating a show that was only 24 hours later than a debut one in a country thousands of miles from home. In fact Sam came across as a confident and assured smooth operator, exercising a sharp wit to more than adequately fill the momentary gaps between songs. Inevitably Sam Outlaw will be judged on the evidence of his songs and these carry a substantial weight.Whether writing from the perspective of a drunk in ‘Jesus Take the Wheel (And Drive Me to a Bar)’ to addressing relationship issues in ‘Keep it Interesting’, high class songs flowed repeatedly with ‘Ghost Town’, ‘Angeleno’, ‘I’m Not Jealous’, ‘Country Love Song’, ‘Hole in My Heart’ and ‘Love Her for a While’ all playing a part in succeeding with that all important first impression. In contrast to probably most of the audience and the balance of the set times, my view was of this being a double header gig. This was obviously from a bias stance as most neutrals would have left with the abiding memory of Aaron Watson in full flow. His ninety minute set backed by a full band (minus pedal steel!) gathered momentum in appeal, brought to a crescendo with a crowd pleasing climax full of mutual adoration and fizzing fiddle from Damian Green. In essence Aaron plays a no holds barred intense brand of country music, rich in Texas dirt and hardened by many miles on the clock around the roadhouse, honky tonk and rodeo circuit. It is definitely music from the heart, initially rejected by the suits before flourishing in the free reins of indie land. Ultimately Aaron did return to the big time last year with a number one Billboard album and the first ever by a solo male independent labelled artist without the backing of major cross country radio airplay. The album in question UNDERDOG was heavily featured during the set, opening with ‘Freight Train’ before multi-peaking with ‘That Look’, ‘Fence Post’, ‘Wild fire’, ‘Getaway Truck’ and ‘That’s Why God Loves Cowboys’. 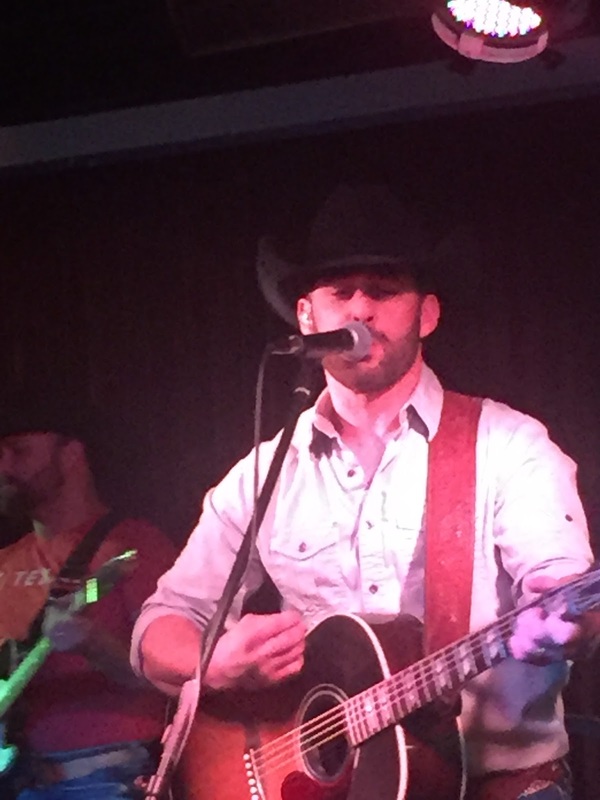 The growing Aaron Watson fan base in the UK will no doubt be aware that this is the twelfth album release from the Texan hailing from the western outpost town of Abilene, famed in many country songs. Those not too au fait with Aaron would have been a lot more informed by the end of this gig as he wears both his heart and life on the sleeve. He comes across as a blessed artist, and negativity was left at the door even when he touched on the darker moments of his life. Melancholy was not on the agenda as the abiding memory of Aaron’s debut show in Birmingham, and only the second in the UK, was of an incredibly positive persona, grateful to all the inspirations in his life. Two notable songs off his previous albums to impress were ‘Reckless’, which proved the show closer subject to a prolonged fun filled finale and ‘July in Cheyenne (Song for Lane’s Momma)’. The latter was written in tribute to a late rodeo star cut off in his prime and followed a touching moment where Aaron shared details of his own loss. All these songs had the backing of Aaron’s excellent band spearheaded by lead guitarist Jason Lerma and supported by drums and bass rhythm section, (names eluded me).It was a lengthy wait for fiddle player Damian Green to be let of the leash, but when set free it was immense. It has already been stated that Sam is set to return to play more shows, while Aaron was adamant that this is just the start of a UK venture without giving further details. What can be concluded from this evening is that extensive merit can be found in both artists and whatever angle you approach your country music, either can find their niche in your listening repertoire. One thing for certain is that Aaron Watson and Sam Outlaw are destined to win over many more fans on our shores. However the dedicated souls present in Birmingham’s Glee Club had the privilege of being there at the outset of this exciting journey.